From time to time, most people today will experience tooth sensitivity. Also known as dentin hypersensitivity, this common dental problem is estimated to affect more than half of Americans. Dental sensitivity can make it difficult to enjoy a cold scoop of ice cream or a hot sip of coffee. Some people only feel tooth sensitivity occasionally, but other feel chronic pain from sensitive teeth. In either case, you should talk to a board-certified dentist in High Point, NC about your sensitive teeth. Dentin hypersensitivity is a common symptom of larger problems, like a cavity or gum disease. 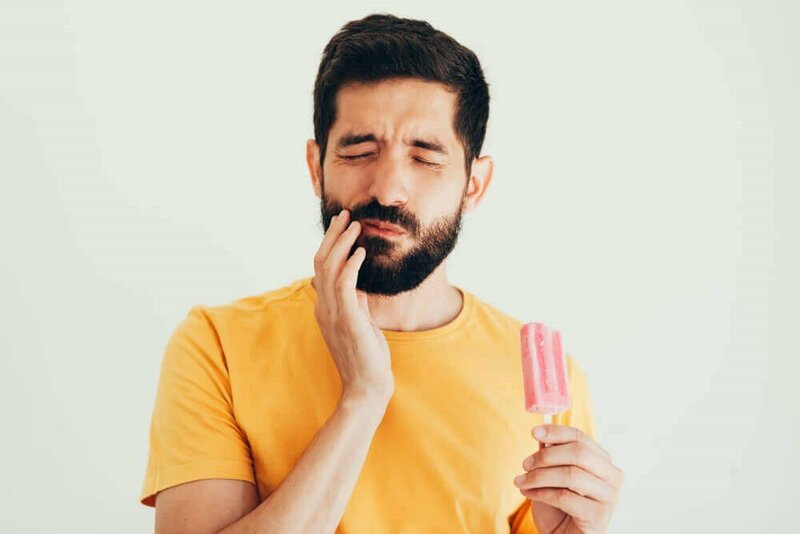 If you're concerned about your sensitive teeth, schedule an appointment with our experienced team at DentalWorks - High Point and read on to learn more about the causes and treatments for dental sensitivity. The hard outer layer of your teeth (the enamel) is designed to protect the interior pulp of your teeth (dentin), which is filled with nerve endings. When the enamel is weak or has a hole, the nerves inside your tooth are easily irritated. Most people notice sensitivity problems when they eat or drink something that is especially hot, cold, or sweet. Pressure changes (such as cold fronts or flying on an airplane) can also trigger pain. Sensitive teeth can be the result of something simple, like overbrushing or using a whitening treatment, but it could also be a symptom of a larger issue, like a cavity or gum disease. It's important to tell your dentist in High Point, NC if you have tooth sensitivity so they can diagnose and treat the underlying cause. Daytime and nocturnal bruxism (teeth grinding) can lead to tooth sensitivity. Typically related to stress, grinding your teeth wears down the enamel and makes them more sensitive. A chip in your tooth or a crack can cause tooth sensitivity. When the outer enamel of a tooth is damaged, your dental nerve may be exposed. When your gums recede away from your teeth (usually the result of gum disease), the tooth roots are exposed. This leads to greater dental sensitivity. One of the symptoms of a cavity is persistent tooth sensitivity. A cavity is an area of decayed enamel that allows air and other irritants to reach the dental nerve. Yes, there is such a thing as overbrushing your teeth. This occurs when you are pressing your toothbrush too hard against your teeth, your toothpaste is abrasive, or you're brushing more than three times a day. If you're using an over-the-counter tooth whitening kit, you may find your teeth are more sensitive. While this usually goes away after a few days, it might be a sign that your enamel is weak, the whitening gel is too harsh, or you are over-bleaching. Your enamel can become weak from many things — decay, aggressive brushing, teeth whitening, consuming acidic foods and drinks, grinding your teeth, and more. Weakened enamel is more susceptible to tooth sensitivity and other dental problems. Most individuals experience temporary tooth sensitivity throughout their lives. A little pain every now and then that may be fixed with anti-sensitivity toothpaste or other home remedies. Even if your sensitivity goes away, you should still mention it to your dentist during your next visit. They may be able to recommend products or home remedies that will limit your sensitivity in the future. If you have chronic tooth sensitivity, schedule an appointment with your dentist. They will look for the cause of your sensitivity, which may be a chipped or cracked tooth, gum recession, or a cavity. Once they diagnose the underlying cause, a treatment can be performed to give you relief. If you're feeling sensitivity in your teeth, try lightening up when you brush, using a toothpaste that's specially formulated to decrease sensitivity, and brushing no more than twice a day. If your sensitivity is caused by whitening your teeth with a store-bought kit, ask your dentist about professional teeth whitening options. DentalWorks - High Point offers both home whitening kits and laser teeth whitening, which your dentist will customize to provide fantastic results with minimal tooth sensitivity. Tooth sensitivity caused by a cavity, chipped tooth, or a crack in your tooth may be treated with a tooth-colored filling or dental crown. The filling or crown will seal and protect the exposed dental nerve. If you grind your teeth, your dentist may recommend a custom night guard to protect your enamel while you sleep. Sensitivity from gum recession will usually require a periodontal treatment. This may include a scaling and root planing treatment for gingivitis or periodontal surgery for periodontitis. After one of these treatment is used to stop gum recession, you may also need gum grafts to restore your gumline. To avoid dental sensitivity, make sure you schedule an annual exam with your board-certified dentist in High Point, NC. They can diagnose and treat problem like cavities, gum disease, teeth grinding, and more before they can cause symptoms like sensitivity. During your exam, you can also ask your dentist to check your brushing technique to make sure you are not brushing too hard. Also, try to avoid foods and drinks that are highly acidic (citrus fruits and juices, soda, and most processed foods) since this can weaken your enamel. To help strengthen your enamel, you may ask your dentist about professional fluoride treatments. To treat or prevent dentin hypersensitivity, talk to your board-certified dentist in High Point, NC. It may be as simple as changing your diet or brushing habits. However, you may need a tooth-colored filling, crown, or periodontal treatment to address the underlying condition causing your tooth sensitivity. Our experienced team at DentalWorks - High Point will help you develop a custom action plan to relieve your dental sensitivity and improve the health of your teeth. Contact our office in High Point, NC to schedule your exam and consultation if you want to fix your sensitive teeth.